Oakley Trucking (No. 137 on the CCJ Top 250), a 100 percent owner-operator fleet, has started a new per-mile pay increase that pays drivers based on their Compliance, Safety, Accountability scores. Read more here. Charles Dickens once wrote the famous line – “It was the best of times, It was the worst of times” in his book A Tale of Two Cities. That same sentiment can be applied to wages in the transport industry. Read more here. The volume of serious 395.8(a) log violations, which affect CSA scores, has increased following the Dec. 18 implementation of the electronic logging device mandate, when a lenient enforcement period was supposed to begin. FMCSA had requested that violations for no ELDs be encoded with a 49 CFR 395.22(a) violation code, thereby not impacting carrier CSA scores during the pre-April 1 soft enforcement. Read more here. Trucking: Is the White House considering a fuel tax hike? President Donald Trump said a 25-cent fuel tax increase would be needed to pay for his new infrastructure plan, a Democratic senator told CNN on Thursday. Read more here. Trucking is one of the most in-demand jobs there is, and as long as goods need to get from Point A to Point B, the need for great, dependable drivers will be there. Truck drivers are so much more than just someone who drives a truck. They’re responsible for customer paperwork, dealing with mechanical issues as they arise, loading and unloading freight, keeping driving logs, and even possibly transporting hazardous materials. They are a vital link in the chain that brings a product from design to the shelves, and as a company, you don’t want to find a good truck driver, you want to find a great one. The world runs on deadlines and a great driver will consistently be there to meet them. If one person in the chain doesn’t show or does their job poorly, everything gets delayed and that one unreliable worker could end up costing you in the long run. A good driving record is an indicator of professionalism and safety. A great driver is always alert. Weather, traffic, and hazardous driving conditions can cause dangers in a matter of seconds, and it’s important to always be aware and to take breaks when fatigue sets in. In a profession where a major portion of the work is done sitting down, it’s essential to take the extra steps needed to stay in shape. A fit driver is more alert and has the stamina needed for long drives, as well as the strength needed for loading and unloading cargo. Truck drivers are not only responsible for their truck and their cargo getting safely to their destination, but they are also responsible for the safety of other drivers who share the road along the way. Anything can happen on the road. A great driver will be able to handle any emergency situation with their truck and their cargo without supervision. Although mechanical skills are not a requirement for being able to drive a truck, a basic knowledge of minor repairs such as changing a fuse or a tire can be helpful and make your cargo able to meet its deadline. Driving a truck, meeting deadlines, and dealing with traffic can be stressful for anyone. Being able to manage day-to-day stresses while remaining calm and cool is a great asset in a driver. Throughout the day, a truck driver is in contact with the company, the clients, warehouse workers, and many others. Good communication skills with a positive attitude go a long way to make any situation better and represent your company with professionalism. Cutting corners can be downright dangerous in the trucking industry. Great drivers follow all safety rules and regulations and can be trusted with whatever cargo they carry. At Trucker Search, we know what makes a great driver because we’ve helped so many of them find great companies to work for. Quite simply, we’re a matchmaker for truckers and companies who need to transport freight. As an employer or recruiter, you can search for drivers who are in a specific location, have certain trailer experience, years of driving experience, etc., and find the right match for your company. As a driver, you can find a company to work for long-term or short, part-time or full, at a local or nationwide company. 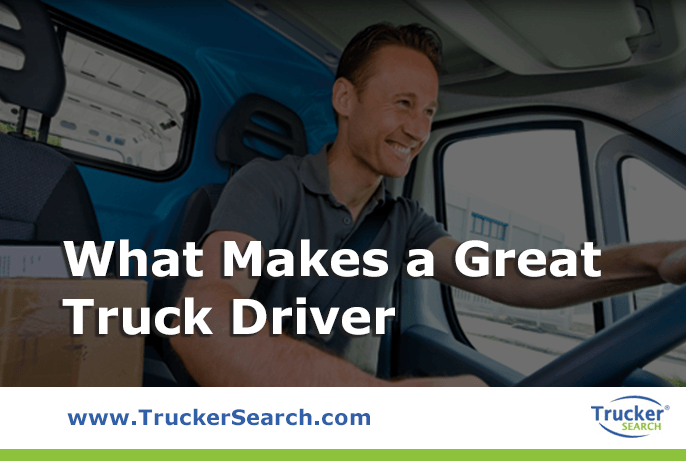 With Trucker Search, everybody wins. Go to www.truckersearch.com today and begin your search for a great trucker or a great job today! Thousands of public comments were filed in the recent 60-day window offered by the Environmental Protection Agency on its proposal to unwind emissions regulations placed on glider kit trucks by the sweeping Phase 2 emissions standards enacted in the final year of President Obama’s administration. And according to those public comments, there is no general industry consensus on the issue. Owner-operators mostly sounded off in favor of EPA’s move to rescind the regulations, while representatives from fleets, truck OEMs, dealers and environmental groups filed comments asking the EPA to maintain the fresh restrictions placed on glider kits. Read more here. The Owner-Operator Independent Drivers Association is requesting President Trump meet with real truck drivers to really hear how the electronic logging device mandate is affecting their business and livelihoods. Read more here. A student in Texas was able to save a school bus full of his classmates when the bus driver suffered from a medical emergency, and he says that part of the credit for the save goes to a truck driver uncle who taught him how to drive an 18 wheeler. Read more here. Because of tax rule changes to itemizations, W-2 drivers will no longer be able to itemize expenses. But there is a workaround. Read more here.